Few people can seem to resist the taste of paneer (Indian cottage Cheese). Frankly I have yet to come across anyone who dislikes or hates paneer. In addition to be universally well liked, paneer also tends to be very versatile and can be used in a variety of savory and sweet dishes. Kadai paneer is a classic North Indian curry that can be seen on the menu of most Indian restaurants around the world. The taste of this curry defies the simplicity of its preparation. This curry is quick to make, uses mostly regular pantry items and tastes fantastic. You could just as easily use this curry as a filling for a sandwich or a wrap as use it as a side dish with Indian flat breads like naan or chappathis. Heat oil in a medium to large heavy bottomed pan. Add cumin seeds to it. When cumin seeds splutter, add onions and saute until onions turn transparent. Add blanched and cut tomatoes and saute until they start to become soft and mushy. Add turmeric powder, chilli powder, garam masala and kasuri methi in quick succession and stir for a few seconds. Turn down the heat to low to medium low. Add cubed paneer, salt to taste and milk. Cover the pan with a lid and allow the paneer to cook on low heat until it softens. Remove lid and allow the paneer to cook until most of the milk is absorbed. Stir gently so that paneer holds its shape. Remove from heat, garnish with finely cut cilantro and serve hot with Indian flat bread or naan or use in sandwiches or in wraps as a filling. Its not absolutely essential to add milk, I've seen many versions without milk. Have even made it a few times myself without milk :) , but I find that adding a little milk makes the paneer a little more softer with a better texture that I enjoy, especially when I use store bought paneer. I loved the recipe..never tried adding milk ...but looks interesting! Yes rightly said even I ahvent heard anyone hatin paneer. Have had this kadai paneer only in hotels, looks rich! 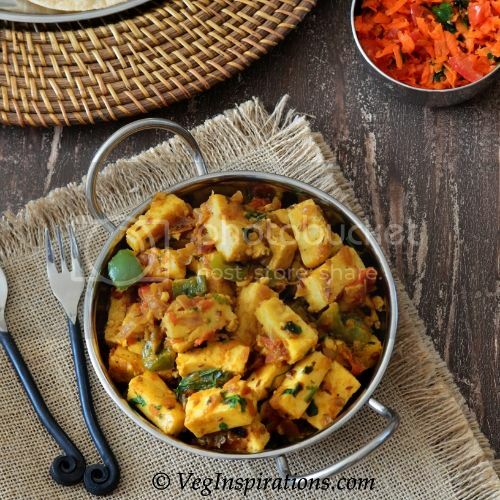 Kadai paneer looks mouthwatering..great pics..
Kadai Paneer is such an evergreen dish..you can try adding some Coriander powder..this looks tempting! Thanks for visiting my blog, Usha ! Loved yours too ! Am exploring all your archives ...have immediately marked your flax seed powder chutney to try out ! Beautiful and tempting kadhai paneer...makes me hungry.. Very true, just like potatoes, paneer seems to be a well-liked item... The picture speaks for the quality of kadhai paneer that you have made :-). Awesome! Cheers to Paneer! Would you give me some to have with my paratha? I totally agree with you, paneer truly is very versatile, kadai paneer looks yumm! love paneer in any spicy form..this one looks awesome..
Paneer..anytime..pls dish out some for me..i love thus dish..nice delicious click.. I had made one just a few days back. Nice Recipe. I am a fan of paneer! Delcious, would love to have with roties. My daughter loves paneer. Wow Usha. I came online looking for a recipe to finish the paneer I have and here you have a paneer related recipe. Thank you! Paneer looks just well blended in the gravy yet in whole chunks in the picture. So restaurant style! I never added milk for kadai paneer- looks tasty! I love paneer recipes and this one tempts me a lot dear. Yummy recipe!!! love anything made of paneer. I usually make dry subji..looks yummy as usual. Thanks for the simple and great-tasting recipe. The milk definitely plays a big part in making this recipe special. I tried this for a potluck Friday night and I am pleased with the results. Thanks for a great website. This is a go-to page for healthy and easy recipes. I like your recipe collection.. Thanks for sharing us.. Must visit my place when time persists..